Motorbike and bicycles are readily available to rent from hotels and shops in the tourist centre. Browse places to stay in Nha Trang on Agoda.com. Free cancellation. If you don’t mind the heat, you can cover sights within the city like the markets, Long Son Pagoda and Ponagar Cham Towers by bicycle. For motorbike, day trips to the mud baths, Ba Ho Waterfalls, Bai Dai Beach and Doc Let Beach are all great options. Driving in Nha Trang is less intense than Hanoi or in Ho Chi Minh City and the pace is relatively slow, however, Nha Trang should not be your first experience on a motorbike. To rent, motorbikes are around 80,000 VND per day, automatic scooters cost 110,000 VND per day. Helmets are required by law in Vietnam. Take care at the roundabouts and watch out for buses – the bigger the vehicle, the less the person driving it gives a damn about human life. A decent city cruising bicycle costs up to 40,000 VND per day. Vietnam Active rents excellent mountain bikes for 140,000 VND per day. They also do van supported cycling trips to Ba Ho Waterfall and Heaven’s Pass where you can experience one of the longest downhill rides in Vietnam. Participants are shuttled 75 kilometres to the mountainous road towards Da Lat, up to an elevation of 1600 metres, then it is a descent past dramatic mountain scenery. The daytrip includes all equipment, guide, lunch, drinks and depending on water levels, a rafting trip down the Cai River. Costs US$70, price drops with more people. Find them at 115 Hung Vuong Street; T: (058) 3 528 119. There are numerous motorcycle tour companies and we counted six with “Easy Rider” in their name. They all do similar one-day or multi-day trips and it’s best to visit the office in person to get a sense of what you are paying for and the quality. A motorcycle trip, either as the driver or as a guide’s pillion passenger, is an awesome way to travel to Da Lat, 140 kilometres away. Rather than being stuck in a bus, you get to drink in this famed mountain drive, stop for photos of the marvellous scenery and visit a few sights along the way. We were quoted US$75 per person for Nha Trang Easy Rider or Easy Rider Motorcycle Trips. 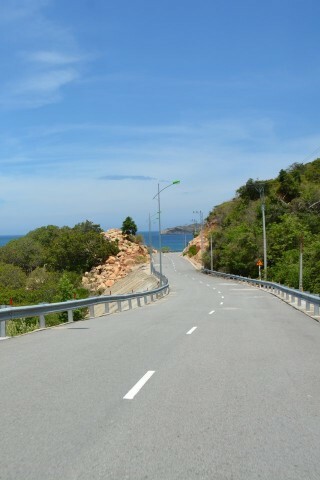 Nha Trang Easy Rider: 23C Biet Thu St; T: (058) 3 523 273; www.nhatrangeasyridertours.com; info@nhatrangeasyridertours.com. And no, we at Travelfish have not decided to venture into the business of motorcycle tours in Vietnam. We have no association with the Nha Trang company that now uses our good name.